This is a keychain lighter in the form of a spy capsule. 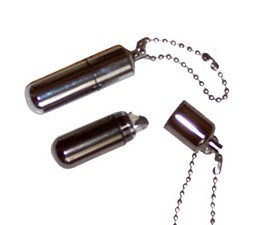 It's as small as the small spy capsules, and comes with a small ballchain for attachment to keyrings purses, etc. The lighter itself is a standard mechanic ignition lighter using standard fuel the zippo fuel refills work perfectly and the flint is also standard and oh-surprise the zippo flints work as replacements. Being in a closed capsule the lighter won't leak fuel and won't smell fuel, with a standard charge of fuel it can work for weeks or months if you don't use it often. Even in a closed capsule the fuel that is very volatile will eventually evaporate but from our quick tests we think it can be months before a charge of fuel renders the lighter useless without use. This means this little lighter is fine in emergency kits or to go camping. It is not wind resistant and there is no shielding from the wind so you need to cover it with your hands as a regular lighter if you are outside. The flame is a regular normal looking flame, not hot enough as the butane piezoelectric ligters but good enough to start a fire and other normal activities. A good keychain lighter with the strong advantage of being very easy to refill and service if needed. You can get it for $5 from EDCdepot.